Captain Phillip G. Jackson graduated from Washington State University in 1992 with a BA in English. In January 1993 he attended Officer Candidate School and received his commission as a 2nd Lieutenant in April. In December 1993 he graduated from The Basic School and was designated an Aircraft Maintenance Officer upon completion of the AMO school in February 1994 at Pensacola, Florida. 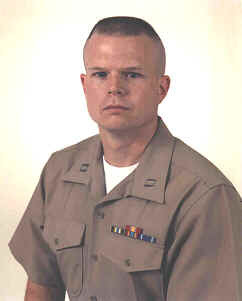 In March 1994, he was transferred to MCAS Beaufort, South Carolina for duty at Marine Aviation Logistics Squadron 31. While there he served as the Ground Support Equipment and Power Plants Officer. He attended two Weapons and Tactics Instruction (WTI) detachments in Yuma, Arizona and one Combined Arms Exercise (CAX) in 29 Palms, California. In May of 1995 he was transferred to Marine All-Weather Fighter Attack Squadron 332 for duty as the Maintenance/Material Control Officer (MMCO) of an F/A-18D squadron. While there he was sent back to CAX and deployed to Aviano, Italy in 1996 in support of NATO peace keeping operations in the former Yugoslavia. He was promoted to his present rank on 9 July of 1997. In December 1997 he reported to MATSG Pensacola, Florida for duty as a Marine Liaison Officer in Aviation Maintenance Squadron One. On 24 March 1999 he assumed the duties of Executive Officer.